This was my 15 minutes of fame. Well maybe 30 minutes and not widespread fame, just in my little art world here at CHA. I was lucky enough to do a book signing and demo at the F&W Media booth. I arrived at the booth to a nice line of people waiting for the 9 free books they were passing out. The first nine people in line got them and they were such a nice group from all over the country. 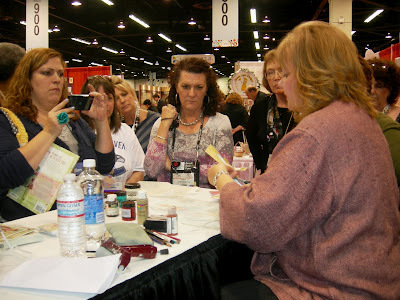 After signing and chatting, I went on to do a short demo and answer questions. I had a lot of fun and enjoyed talking with my little crowd of creatives. The top picture is a 4' tall piece I did for the booth prior to the show. I had a couple of small pieces displayed also and as a result Hobby Lobby picked up the book! It helped that they could see the actual art. 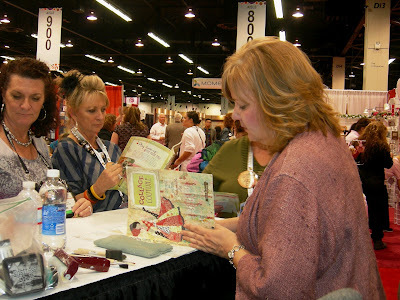 After the signing I was off to the Prima booth where more goodness happened but that will have to wait for another day! Congratulations Julie! 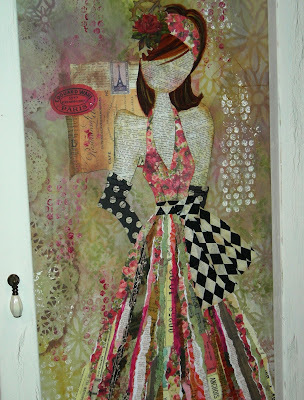 I saw your work at the Prima booth....Gorgeous! They were nine lucky people--that is a good book! Julie, so good to see you at CHA. 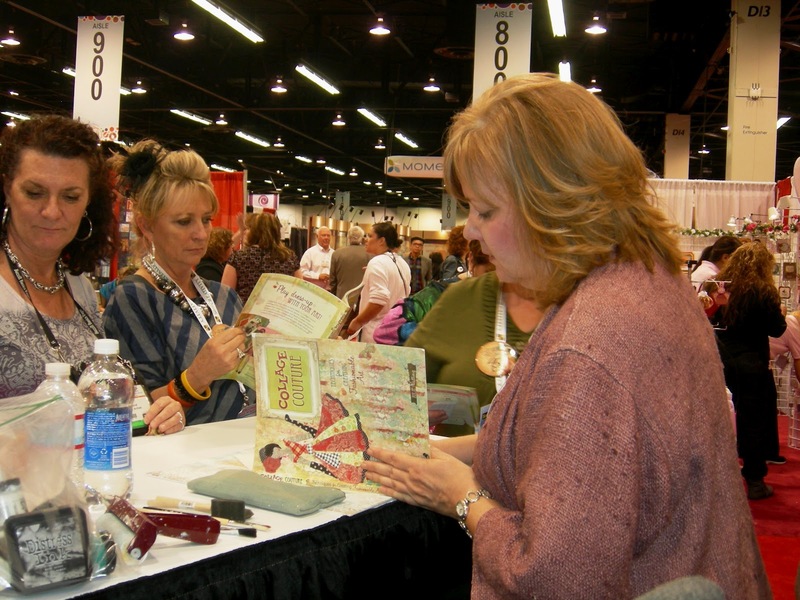 I loved catching up with you and seeing your incredible creations at Prima and F&W. CONGRATS on the Hobby Lobby pick up! That is excellent. Hope to catch a class with you again soon, but until then, will be drawing inspiration from my own copy of your wonderful book. OMG.... Love that girlie!!! Definite claim to fame!!! My book is being delivered via Amazon..Mr. Createology got it for me for Valentines. 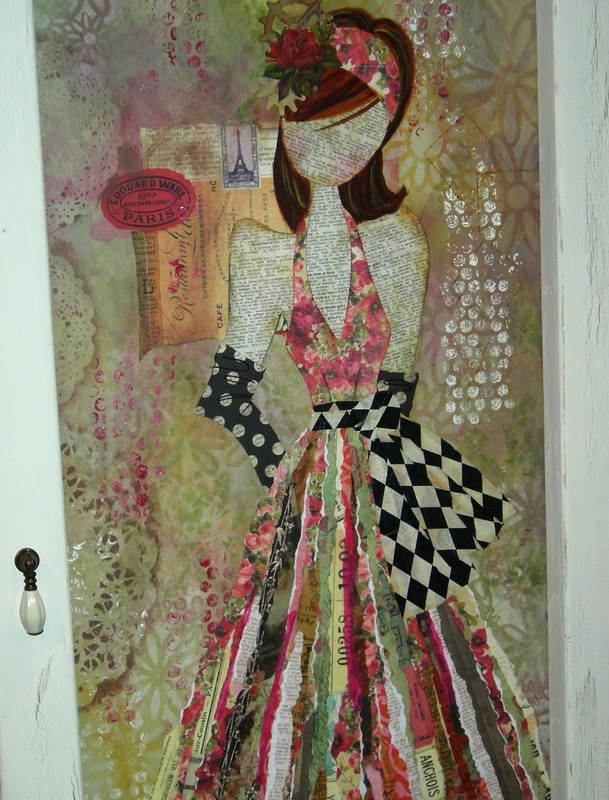 I so adore your art girls! And for all the positive possibilities in your future! Exactly! That is phenomenal, Julie! I am so happy for you! SO well deserved! Hi Julie - well deserved in indeed - so glad I found you. How did you get involved with CHA and PRIMA? I would die to do some work for PRIMA!